Something’s Gotta Give is a 2003 American romantic comedy starring Jack Nicholson and Diane Keaton who find love for each other in later life, despite being complete opposites. 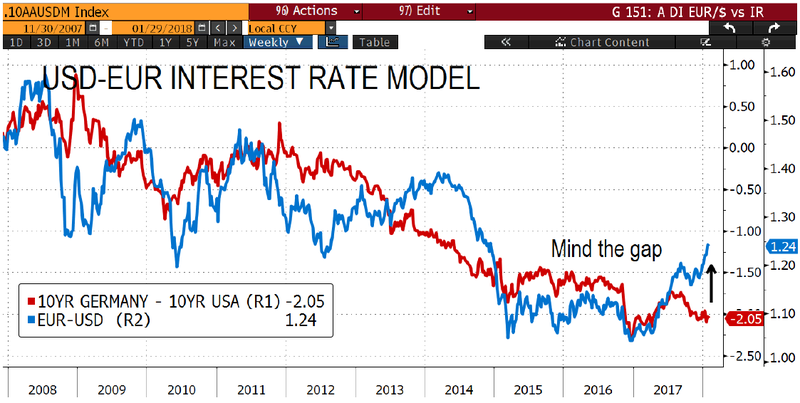 Why is the USD so weak recently despite the 10-year interest differential between the US and Germany indicating the opposite? This spread which historically has been a good indicator has increased since November as US interest rates have gone up more than their German counterparts. The USD dollar could be weak because of expected increasing budget deficit and a weak perception of the Trump administration. The EUR could be strong because of stronger than expected European economic activity, foreign investors’ interests in buying European assets and or market expectations that the ECB will soon move towards reducing its monetary accommodation. The USD is now clearly oversold by any technical indicator but German interest rates are probably one of the most missed priced asset as a result of quantitative easing. So something will have to give! Being long the USD while shorting 10-yr German bund and buying 10-yr US Treasuries could be the way to play this convergence.